Salvation And Survival: Do You Know Your Measure In The Kingdom of God? Do You Know Your Measure In The Kingdom of God? I ask that question because it was what I asked myself as I was studying 2 Corinthians, Chapter 10. The latter part of this chapter concerns Paul discussing his mandate [or assignment] from the Lord. Apparently, within the Church at Corinth, the believers were preoccupied with setting standards of their own regarding the efficacy [value or benefit] of another's ministry. Various opinions, theories, and religious philosophies were discussed and then either copied or compared, resulting in human evaluations that left people either prideful or discouraged, depending on the consensus of the church. You see, I've always had a problem with the Church deciding they were the arbiter of God's commission on my life. It has always seemed to me that if I didn't follow the prescribed "rules" of what ministry was supposed to look like, it was made clear that I was outside God's domain. But once I received the revelation that Christ passed His authority on to us, I began to realize that God was the administrator of where and how I would serve Him. Furthermore, I came to realize that God has designed each of us in a unique manner that serves Him best. We have been given the gifts and spiritual authority that are necessary to continue Christ's dominion on this earth. In other words, there is a unique job for each of us, and my job may look different than yours, but we both have the same objective -- to see God's Kingdom expanded upon the earth. Let's refer back to Paul's statement. There is a "measure of work to which God has appointed us". The Passion Translation of 2 Corinthians 10:13 says that this word "work" comes from the Greek word metron, which was the length of a race course, and it was used to define the boundaries of a Greek stadium. This should make us think of the references to "running the race" that Paul makes throughout his letters to the various churches: "let us run with endurance the race that is set before us" (Hebrews 12:1), and "if only I may finish my course and the ministry that I received from the Lord Jesus" (Acts 20:24), for instance. This tells me that we have each been given a sphere of influence that will be suited to our gifts and the level of authority we have been given. But there is more to this concept of "running in our lane" [which is the boundaries of our ministry from God]. There is the idea of the expansion of those boundaries to benefit the Kingdom of God. I believe it was in the 1990's when The Prayer of Jabez was so popular. The verses in 1 Chronicles 4:9-10 read, There was a man named Jabez who was more honorable than any of his brothers. His mother named him Jabez because his birth had been so painful. He was the one who prayed to the God of Israel, “Oh, that you would bless me and expand my territory! Please be with me in all that I do, and keep me from all trouble and pain!” And God granted him his request. The Christian culture was captivated by what they discerned was a quick prayer to increase their material well-being. I will agree... we serve a God of Increase and Enlargement. But our material well-being is a by-product of how well we administer the territory [or sphere of influence] and the gifts we have been given by the Father. Just as Jesus prophesied that the Apostles would be His witnesses first in Jerusalem, then Judea, Samaria and to the ends of the earth, we have each been given the same potential to expand our territories of influence for His Kingdom. If we are obedient to the leading of the Holy Spirit, to His promptings, and to His instructions, we can expect the measure of our ministerial influence to expand. It goes without saying that our primary purpose is to expand the Kingdom of God and not our personal empire. But it is also true that we can expect God's blessings when we use our authority to widen God's influence in the world. As we fulfill our potential within the boundaries God has established for our ministry, He will push those boundaries back, giving us room to grow and widen our sphere of influence for Him. And I hope that everyone realizes that we each DO have a ministry; a purpose for our life to serve others as we serve our Lord. If you aren't aware of what yours is, ask Jesus to show you. You may start out small, but as you are faithful to your calling, and you desire to expand your territory in a spirit of humbleness and love for the Lord, the Father will do as He did for Jabez, and grant your request. So, I come back to my original question ... Do you know your measure in the Kingdom of God? Do you know what your purpose and your assignment or mandate is? Can you identify your sphere of influence and perceive the boundaries of your spiritual territory? If not, then pursue those answers. Your life will be eternally richer for it. And if, like Paul, you know the course of the race set before you, do not be satisfied with limits on your boundaries. 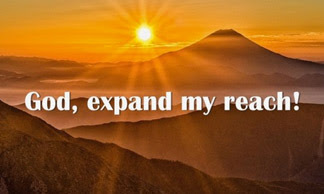 Ask God to expand your territory so that you can expand His Kingdom. You, too, will find eternal rewards beyond anything you desire. Isaiah 54:2 "Enlarge the site of your tent [to make room for more children]; Stretch out the curtains of your dwellings, do not spare them; Lengthen your tent ropes and make your pegs (stakes) firm [in the ground]".